HardiePlank® lap siding is the most popular brand of siding in America and can be found on over 4 million homes. You want the strength, beauty and durability to attract home buyers. HardiePlank® siding enhances and protects homes in all kinds of climates—and now, with the Hardie Plank, James Hardie provides siding with specific performance attributes relative to the climate where the product is being used. James Hardie now gives you the optimum siding for your project and climate, regardless of location. HardiePlank® lap siding comes with a 30-year nonprorated, transferable, limited warranty—our strongest warranty ever. All HardiePlank® lap siding comes in a variety of looks and textures, all of which are engineered for climate. We are so sure about how well the Hardie Zone system will perform, HardiePlank® lap siding comes with a 30-year nonprorated, transferable, limited warranty—our strongest warranty ever to give your customers peace of mind. Tired of that old run down looking home you’ve been living in? Why not upgrade your home to a new look, and increase the value of your home in the process. You can have the home of your dreams and it is not as hard as you think. Your home may look run down and the paint may be thirty years old and peeling off, but you can have the best-looking house in your neighborhood. How? Just give it a new face-lift with colorful and easy to maintain vinyl siding. 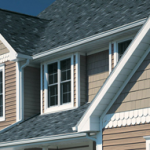 Roofmasters offers vinyl siding that comes in a variety of colors and you can choose the one that is right for you.